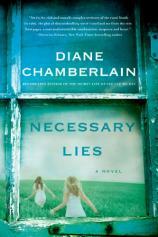 Bookreporter.com: NECESSARY LIES deals with some controversial topics, one being the Eugenics Program, in which “undesirable” people (i.e. the “feebleminded,” the poor, promiscuous types, and often people of color) were sterilized against their will in order to promote selective breeding. While it did get its wings in Nazi Germany during WWII, the movement was also scarily popular in the U.S. afterward. You mention on your website that you had the idea to write about it six years ago but were talked out of doing so. What made you take up the subject matter again, and how did you go about researching it? Diane Chamberlain: The US Eugenics Program actually predated Hitler's, and he pointed to them as part of his inspiration for his own plan for a "Master Race." But after World War II, most states saw the error of their ways and stopped their programs. North Carolina, however, kicked theirs into higher gear. It's true that when I first broached the topic with my agent of setting a story against the backdrop of the Eugenics Program, she wasn't taken with the idea. It was in the news a great deal in North Carolina, so I was quite familiar with it and it seemed a natural fit for my writing, but to a Jewish New Yorker, it must have seemed like a pretty uncomfortable and unpleasant topic for a novel. I understood her reaction and wrote a few more books. However, in 2011, the topic was back in the news as hearings were held in North Carolina during which victims of forced sterilization told their stories. I felt absolutely driven to create a story with the Eugenics Program as its backdrop. When I told my agent I simply had to write it, she gave me the go-ahead. Q: The book is written from multiple characters’ perspectives, mainly Jane’s and Ivy’s. Why this choice, and did you begin by writing the book this way or did you experiment with another format --- say, a straight narrative --- first? DC: In recent years, my books have all been told through (mainly) multiple first-person perspectives. As a matter of fact, I usually have three or four points of view. Once, even five. So writing from only two perspectives was unusual for me, but perfect for the story. I knew from the start I would have two narrators and that they would come from two different worlds. I loved their different voices, and I loved that, on a very deep level, they had more in common than anyone would guess. BRC: Much of the dialogue and first-person narrative in NECESSARY LIES --- especially in Ivy’s chapters --- is written in a Southern drawl. When writing in dialect, are there tactics you use to make sure whatever you’re writing sounds natural? DC: I had to decide how to handle Ivy's use of language. Quite honestly, I tamed it down, because I find it annoying to read an author's attempt at illustrating any sort of thick accent. Having lived in North Carolina for eight years now, I no longer even notice when people say "ain't" for "isn't" or "don't" for "doesn't." For Ivy, I settled on using "was" for "were" (as in "We was going to the store"), some "don't"s (as in "He don't know any better") and an occasional "ain't", although Ivy often corrects her own use of that word. My hope was that this would be just enough of her colorful language without overwhelming the reader. BRC: The book is set in the segregated South. As a resident of North Carolina, did you face any particular challenges when writing about that time and place? DC: I really didn't. I spoke with many people, both black and white, who were raised in both the cities and the countryside, and to a person, they all seemed to love telling me about their lives. I guess what struck me the most, as someone who spent her first 23 years in New Jersey and California (i.e. not in the south), was the ease with which they talked about the way things were. BRC: At the beginning of the book, Jane takes a job as a social worker, working with poor families in rural North Carolina. You also have a background in social work and psychotherapy, specializing in adolescents. How did this help in crafting each of your characters? DC: Although Jane was a welfare social worker and my work was much different as a hospital social worker and psychotherapist in private practice, I was very aware of a common thread in our work, and that was having power over people's lives. In my case, I had the ability to remove a newborn infant from his mother or place a teen into a psychiatric hospital against her will. That power was always a scary thing to me, and I took my responsibility seriously. In Jane's case, not only does she hold the welfare of her clients in her hands, but their ability to ever have children as well. That is extraordinary power for a social worker, and on every page, I thought of how it felt for Jane to have that responsibility. I believe my background in working with adolescents has helped me tremendously in creating my teenaged characters, and there are nearly always one or two of them in my books. Even though Ivy comes from a very different class than I was accustomed to working with, she is still a teenager with the same longings and fears that are true of nearly all teens. I loved getting to know both these young women. BRC: When Jane’s boss, Charlotte, introduces Jane to Ivy and her family, the two social workers have very different opinions about what should be done to help. Ever the idealist, Jane hopes to keep the family together despite seemingly insurmountable odds while Charlotte advocates sterilization for Ivy and a foster home for Ivy’s sister’s child. This line sums up Charlotte’s attitude: “All the love in the world doesn’t put food on the table.” It’s a very charged scene. Is there a message you hoped to get across by framing it in this way? DC: Charlotte is a realist with many years' experience working with people in need. She's tired. Too tired, perhaps, to look for creative ways to solve a problem when it's so much easier to simply remove a child or sterilize a wayward girl. Jane is an energetic idealist who longs to find those creative solutions. But there is no true right or wrong here, and if I had a message in this particular scene, that was it. There are children who need to be removed from the home, and there are people for whom sterilization is the kindest solution to the risk of pregnancy. I believe that lack of a clear right or wrong creates a more intriguing story. BRC: Later, when Jane is discussing the trials of her new job with her husband, Robert, he blurts out something I’m sure you’ve heard plenty of times before: “Nobody gave me a handout. I did it all on my own,” and, later, “most of those kids would’ve been better off if they had never been conceived.” What (or who) did you have in mind when you wrote those lines for him? DC: How to answer this diplomatically? Yes, I hear this often, and it puts a knot in my stomach. All I can say is, "There but for the grace of God…"
BRC: Speaking of Robert, he’s a bit of a fuddy-duddy. He’s a hard-working pediatrician, yet he soon grows exasperated because of Jane’s job and has no compassion for her clients. At times, it’s easy to dislike his character and his snooty ways. But did you also want your readers to sympathize with him? Is Jane also at fault? DC: I think we have to realize that, while women faced societal expectations in 1960, men did as well. Especially for someone like Robert, who raised himself up by his own bootstraps, his social standing is extremely important to him and anything that might harm that standing is a threat to him. So to have a working wife --- especially a wife who does such "demeaning" work --- scares him. He doesn't know how to handle it, so he handles it poorly. Jane and Robert are both at fault for rushing into a marriage without really knowing each other. They were still caught up in the romance of their relationship rather than the reality. Things Robert found adorable about Jane as a girlfriend were not so charming when she became his wife. BRC: Some of the characters in the book are quite significant to the story but don’t have a ton of stage time. I’m thinking of Mary Ella and Eli specifically. How did keeping their stories (and their secrets) central but hidden add to the overall flow of (and tension in) the book? DC: It's always a challenge to give secondary characters the right amount of "stage time." Mary Ella and Eli are both mysterious characters, keeping the reader guessing as to what is really going on with them. It was fun for me as the author to slowly reveal their stories, and I hope it's enticing to the reader to learn what's going on beneath their shadowy exteriors. BRC: Toward the end, Jane makes a fairly bold decision about the direction that Ivy’s life is going. Can you talk a bit about your decision to orchestrate this turn of events (if you don’t mind spilling a few but not all of the beans) and what it adds to the story? DC: Since I don't want to give anything away, I will just say that I had to determine how Jane would handle the ethical dilemma in which she found herself, and I decided I would not let her go halfway. It was all the way or nothing! BRC: The title of the book is NECESSARY LIES. But so much of the book is about telling or facing the truth, even if it does significant damage. In fact, many of your books carry this theme. As an author and as a person in the world, what makes you keep coming back to it? DC: Good question! The book I'm working on right now is again about facing the truth and it is indeed a theme I seem to return to unconsciously. As a therapist, I saw the damage caused by family secrets. Often those secrets were kept in an effort to protect someone from being hurt, but ultimately, they led to greater pain and destruction. There were no big secrets in my own family (that I know of! ), but seeing them in other families really colored my feeling about the healing that can only come from honesty. BRC: You published a short eBook called THE FIRST LIE that takes place before NECESSARY LIES. How did the idea for this story come about, and should it ideally be read before or after the full-length novel? Would you ever consider writing an additional eBook about Henry and Ivy after NECESSARY LIES ends? DC: I wrote THE FIRST LIE months after writing NECESSARY LIES. I came up with the idea of writing a short story that could be released first to introduce the characters to my readers and hopefully entice them to read NECESSARY LIES. If I had it to do over again, I would title it THE FIRST LIE: A Short Story, because, although the description clearly states it's a short story, some readers thought they were getting an entire book and were not happy with me about it! I hate that they might have felt misled. But back to your question. Although I hadn't intended to write about Ivy again, when the short story idea came up, I was excited to revisit her, and I wanted to pick a pivotal time in her life that occurred before the book NECESSARY LIES opened, so I chose the night Ivy's 15-year-old sister Mary Ella gives birth to her son, and I hint at what is to come in the book. THE FIRST LIE doesn't need to be read at all to enjoy NECESSARY LIES. I view it as a bonus, and although I intended it to be read before the book, I think it would be just as satisfying to read it after. BRC: I read in the news recently that North Carolina has been legislating to compensate anyone still alive in the state who might have been a victim of the Eugenics Program. What are your thoughts on this? Too little too late? Should other states follow suit? DC: You are really hitting all my emotional buttons in this interview! Yes, after several years of refusing to pass legislation to compensate living victims of forced sterilization, North Carolina has agreed to compensation. Ten million dollars has been set aside and will be split between the victims who have come forward in 2015. So far, only about 200 have done so. Most have died. Many are dying. Some have kept their sterilization a secret. Some are too ashamed to admit what happened to them. Others may still not know what was done to them. Too little too late? That is not exactly how I feel. I'm very glad North Carolina is finally stepping up to the plate, but at the same time, the current government is hurting the poor and powerless in myriad other ways by cutting Medicaid coverage, unemployment benefits, early education programs, etc. It's hard for me to celebrate right now. BRC: One of the requirements for sterilization is a low IQ. But Jane argues that many poor children score low because of their environment, not because of their intellect or what they might be capable of. Couldn’t this same argument be made for standardized tests today? DC: I'm not an expert on the cultural bias in testing, but my research leads me to believe that, while improvements have been made, a bias still exists. BRC: What are you working on now, and when might readers expect to see it? DC: I've nearly finished my next as-yet-untitled book. It's about a young woman who believes she has no family. She's wrong. Talk about family secrets --- this one's a doozy!